We watched Wreck-It Ralph at Robinsons Movieworld last Sunday upon the little boy’s insistence, and I was glad we did because it was really a nice movie. Our 6-year-old son loves arcade games and computer games, so we weren’t really surprised that he enjoyed Wreck-It Ralph because it is a movie set in the video game world. Bad guys can be heroes, too. This was evident in the film Wreck-It Ralph which is still showing in Metro Manila theaters. Ralph is a character in a video game. He plays the bad guy, wrecking everything, while Fix-It Felix is the good guy, fixing everything Ralph destroys. Now, Ralph is tired of always being the bad guy. He wants to prove to everyone that he can be a hero, too. He journeys between games in the arcade to fulfill his dream of becoming a hero. In the process he met characters from the other games, like Sergeant Calhoun from Hero’s Duty and Vanellope von Schweetz from Sugar Rush. Vanellope and Ralph eventually become good friends. A deadly enemy threatens Sugar Rush, and the entire arcade will be doomed if this enemy is not defeated. This is where Ralph comes to the rescue. Find out (by watching the movie) how Ralph saves the day. Wreck-It Ralph is worth watching because of its wonderful storyline, vividly colorful visuals, and its emotional appeal. It’s a movie that kids and adults alike will surely enjoy. 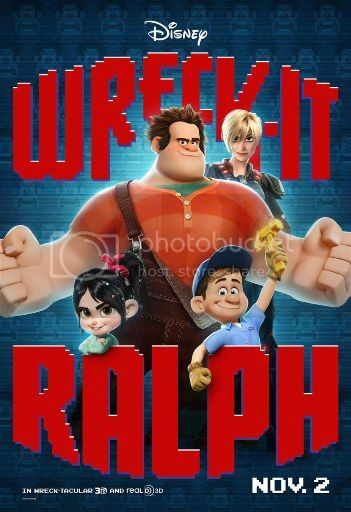 Wreck-It Ralph is a 3D computer-animated comedy film produced by Walt Disney Animation Studios. This entry was posted in Movie Review, Robinsons Galleria, Robinsons Movieworld. Bookmark the permalink. it’s been a long time since we watched a movie. we’ll look for a movie to watch this weekend. good movie for kids and adult alike. I want to watch this movie with Ykaie but I want to watch Skyfall first..LOL! Thanks for the review! Will watch it!